This One Act one-woman musical theater piece was premiered at the Regent Theater in Arlington, MA in 2008 after developement with dramaturg and Greek myth scholar Mary-Ann Greanier. Princess Electra comes from family dysfunction deeper than most of us can fathom. Her father, Agamemnon thumbs his nose at the goddess Diana by shooting a stag in her forest – a serious no-no. When Diana threatens to strand Agamemnon’s entire army at sea, Agamemnon sacrifices Electra’s older sister, Iphegenia. To avenge Iphegenia, Electra’s mother Clytemnestra, murders her Agamemnon. And to avenge his father, Electra’s brother Orestes murders their mother. And you thought your family was bad? 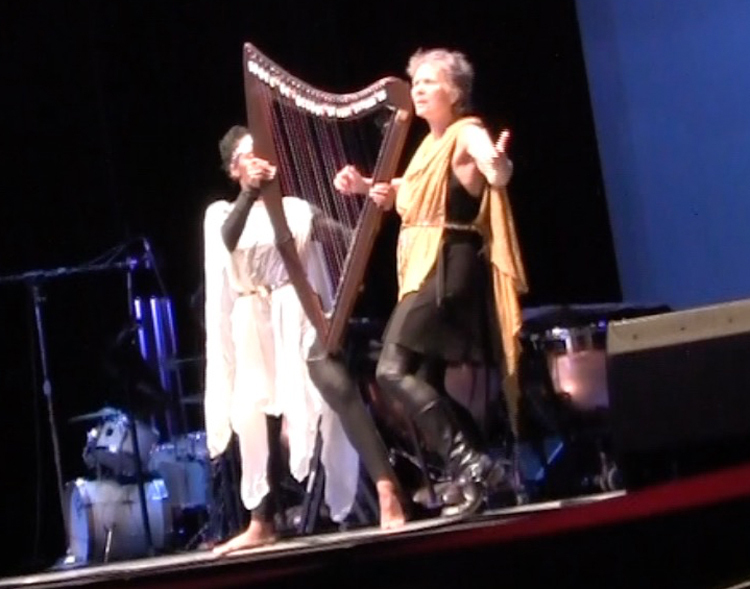 In “Electra’s Lyre” Electra returns, determined to find personal redemption and a way to retell her own story that can release her from this legacy of violence and dysfunction. She visits the men who have coopted her story: Freud, Jung and the brothers Grimm, she confronts her deep confusion about whether her mother was evil or good – and searches for a way to turn her parent’s instruments of violence – the bow and the dagger – into an instrument of her own redemption, and a way to reclaim her own voice. 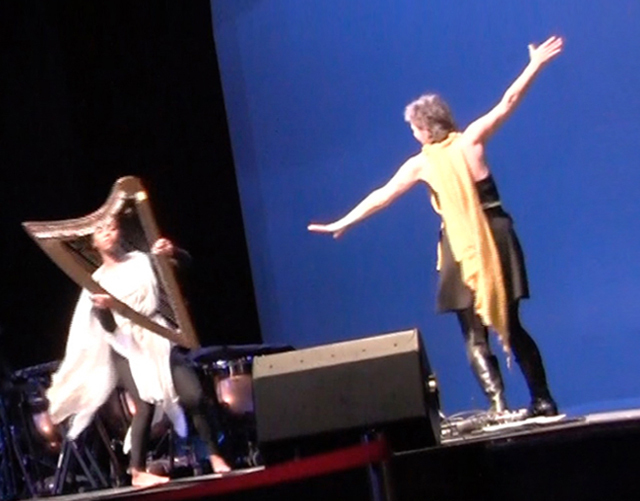 How to Program "Electra's Lyre"
“Electra’s Lyre” is great to program as the first half of a 2-part concert or show, with a second half that can include shorter musical works and a talk-back Q& A with the audience. “Electra’s Lyre” is especially great to program as part of a residency to include women’s studies, history, philosophy and both dance and music departments. SET & STAGE: Single set; Black box or standard stage. 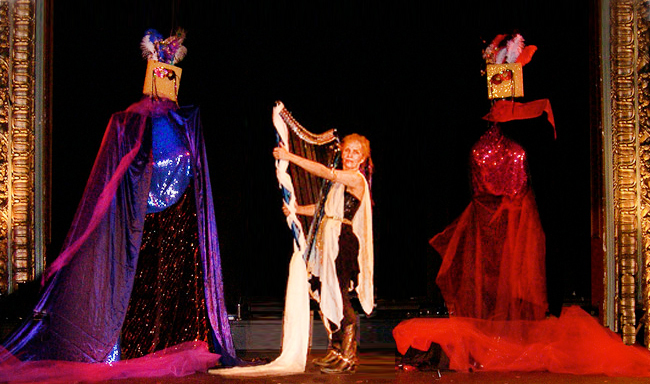 In the original show two 15-foot puppets were created using speaker stands, masks, ribbons and fabric. They’re not essential for the show but they add a visual element. The first scene has also been performed as a duet with dancer.